Update: I was able to purchase these items. They became in stock and I spent $54 plus about $3 in taxes. I received free shipping since it was over $50. I already had $37 in MaxPerks so I just applied the $37 Gift Card Number with the Pin Number and redeemed my Maxperks. I paid the remainder $19 with my credit card. 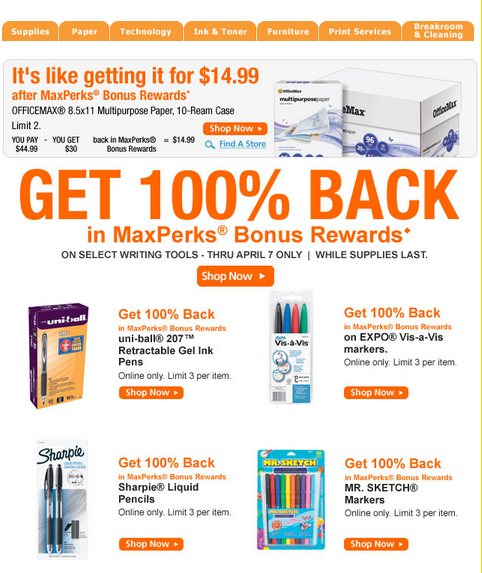 I'm so excited to get so many Free After Rebate items!! Before blogging about this deal, I wanted to check these items for myself. Unfortunately, all of them are out of stock already. I only received the email from them within the hour!! I will keep checking back to see if they become available. I will write about MaxPerks soon.